With their slightly salty and meaty flavor, mussels are a relatively low-fat source of protein, iron and vitamin B12. Their flavor works with a variety of other ingredients, ranging from coconut milk to tomatoes. They cook quickly, typically in less than 10 minutes. While reheating mussels is possible, it poses some problems. 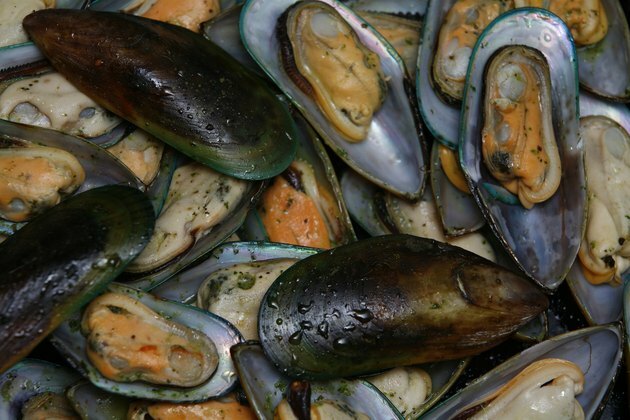 Leftover mussels must be refrigerated to keep them free of microbes that cause foodborne illness. When you refrigerate the mussels, refrigerate them separately. Do not refrigerate them in a sauce, stew or other type of liquid. To keep the mussels from becoming rubbery, you need to reheat them in the gentlest manner possible. Other liquids should be heated first, with the mussels added later. Soups and chowders are ideal ways to reheat steamed mussels. Place the soup or chowder, without the mussels, in a saucepan on the stove and turn the heat to medium. While the soup is heating, remove the mussels from their shells. If desired, you can cut the mussels into smaller pieces. Once the soup is heated, add the mussels and heat until the mussels are warm. Do not allow the soup or chowder to boil once the mussels have been added; this would result in rubbery meat. Tomato-based pasta sauces work well with mussels. Heat your pasta sauce on the stove. Once the sauce is warm, add the mussels. You can either remove the mussels from the shell or leave them in the shell. Continue heating the sauce until the mussels are warm. Serve over linguini or another type of pasta. You can transform your reheated mussels into an elegant appetizer. Heat your oven to 350 degrees. Place your tart shells or pastry dough into small tart tins and bake until they turn golden brown. Remove the tart tins from the oven and add the meat from several mussels to each tin. Brush on some herb butter, if desired. Bake for an additional 5 minutes to heat the mussels. How Many Calories Are in Five Large Sea Scallops?